The Lakeland Legacy Society honors a special circle of donors, those friends of Lakeland Health, who have remembered the hospital through the gift of planned or deferred giving. Through the years, Lakeland Health has enjoyed a rewarding partnership with the people it serves. The communities have given generously and the hospital in return has provided the community with the finest-quality care. We cherish our loyal friends and greatly appreciate their generous gifts in support of excellence at Lakeland. Their donations have helped our hospitals acquire the newest medical technologies, modernize our facilities and implement innovative healthcare programs and services. You are invited to join this forward-looking circle of benefactors who belong to the Lakeland Legacy Society. In addition to helping secure medical excellence for the future, you can receive significant tax advantages from a carefully planned estate. You can join the Lakeland Legacy Society by making provisions for Lakeland Health through your will, estate plan or life income agreement. The Lakeland Legacy Society is open to all friends of Lakeland Health. Gifts of all sizes are valued and welcome. There is no minimum amount required to enjoy full membership in the Society. 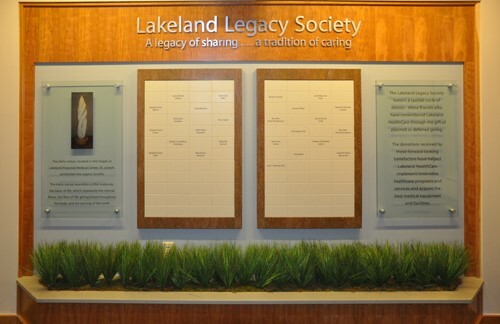 Legacy Society membership is awarded when Lakeland Health Foundations are made aware that we are designated a recipient in someone's estate plan. For more information on becoming a member of the Legacy Society, click here to see our page on Gift Planning.